There’s no better way to get your adrenaline pumping than to amp the atmosphere up with LED lighting, energizing music and being surrounded by excited, stimulating people. Additionally, CycleStation in Ft Myers offers the most comprehensive technology to track your progress. It’s called Heart Zones. Heart Zones is the original heart rate training company. Pioneered by Sally Edwards since 1993, Heart Zones has paved the way for individuals to get fit using heart rate training. Over the years, Heart Zones has evolved into a fitness technology company, specializing in education and training. We caught up with Dave Mainous, certified, master-level, indoor-cycling trainer with CycleStation to find out more about Heart Zones. H&W: Tell us about your experience and how Heart Zones is helping clients achieve results. DAVE: “We train our clients based on heart rate. The primary basis is getting people moving. In Sacramento, California, Sally Edwards, a former triathlete and Ironman invented Heart Zones. It’s a patented fitness program and was the first in the world. You can use it in many different forms of exercise, working out or just going about your day. At CycleStation, we of course, use it for indoor cycling in general. Heart Zones is something anyone can do at any level, and at any age. 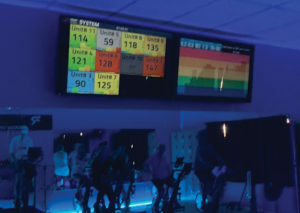 The wearable technology monitors, measures, and keeps track of heart rate through an online application that pairs with a monitor, which is set- up in the cycling studio. The screen, which is a large area on the wall, shows the different zones of intensity for individuals within the group. The system is developed around points. It tracks progress so that clients can see their results on the board, which specifically coincides with each person. I personally provide each client with a number, so that the board doesn’t show their name, just their number to keep it more private for each client. The technology is Bluetooth, which allows me to send my clients results directly to them so that they can keep a copy of each ride results at the end of each class. It shows progress and results. It’s an excellent tool to evaluate and assess exercise goals and outcomes. CycleStation is an indoor cycling studio that not only offers the latest and greatest in bikes, music, fitness experts, and commitment, but also in the investment, they make in you. Because of their dedication to helping you see results, they offer different stages of workout levels from 45 minutes to 90-minute sessions. Depending on your intensity level, you can burn anywhere from 300 to 600 calories during your session. You can schedule your class online or just pop into the studio for a schedule. Bring your workout gear, sneaker or bike shoes, and you’ll be ready to speed up your metabolism, burn calories, increase muscle and endurance and have fun!